After another long disappearing act, I am back. Bangalore has been keeping me busy with hardly anytime on weekends. However, I am back with the bang as you can see that your favorite blog has a new look and much easier on the eye. And I promise you, recipes will keep on coming. This is what I ended up with and I have to admit, it just came out awesome, at least if I believe my wife and kids. Thing is corn is super healthy and full of nutrition. If you have it this way, it just adds the flavour to the health. First of all, steam the corn. Either in Microwave or in a pot. It will take only 10 minutes. Once it is steamed, take it out and let it rest. 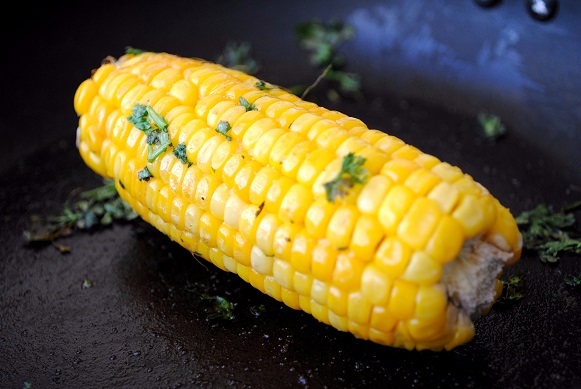 Add butter and just add corn. Don't wait for butter to melt. Saute it for 2 minutes. Add little salt as per taste. Squeeze lemon over it and give it a stirr. Voila! it is done. 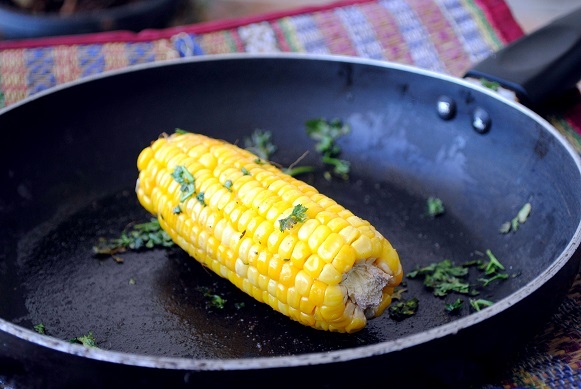 This super easy corn is ready for you. Kids love it. You can find few more kids recipes on this link. Thanks again for reading. Do rate the recipe and share your comments and feedback. Come Holi and come those specific dishes like Dahi Bhalla or Dahi Vada ann Gujiya. Though I am not a meetha fan, but I do love Dahi Bhalla, well, not because my surname is also Bhalla. But just that it is such a nice Indian snack or chaat as you might call it. You see in every market that you go in Delhi, there will be people eating away Pani puri, chaat, tikki and Bhalla Papdi. Even in marriages, this is a given you will get to eat it. But what we make at home is generally Dahi Bhalla sans the papdi. So, this Holi, I thought of adding that papdi to Dahi Bhallas but in a different way. I got my idea from this Laccha Katori that is another nice indian snack. So, I came up with my own Dahi Bhalla Katori. Now, as you would imagine how much fun it would have been to bite into it. The lovely taste of those Dahi Bhallas and crunch of the crispy katoris. It is actually fun when you give twist to those dishes favorite to all but in a way that it only adds and does not mess up with the flavors. Lets get down to the recipe now. Moong Dhuli Daal. (skin removed from Green Gram) This should be 1/3rd of the quantity of Urad dal. This dal helps to avoid gastric issues. Raisins. This is also optional. Bhavna again this side. Well, I am sure you must be getting all the non-veg recipes from Raj but It is me who gets in kitchen to cook something new and different with veggies. Today is a simple Uttapam Recipe but with a twist and presented in a wonderful way which will make your kids and guests eat this famous south Indian dish with much desire. Look at this pic and see how a boring dish (as per my Raj) can be turned into a super rockstar (as per Raj again). Raj was home little late and as usual said that he is hungry. So he wanted something to eat with tea. Now, there are times like these when I start thinking on making something nice for him. And then came the idea of making Uttapam on Bread. One of the rare days when I wanted to cook something veggie and for my kids which is delicious and not spicy, I could think of fusion. While coming back from office thinking what could I make, the spark in my head told me to do a twist to spicy Tortilla Wrap recipe. You can even make this for kids' lunch box. You might also want to look at Egg Bread Pitt recipe here, especially for kids. Tortilla Wraps basically come from Mexico and are known to be spicy as most Mexican food is. But this time what I will share with you is a nutritious and yummy recipe which not only tastes good but looks good and give something new to your kids. You will find that the recipe so much resembles Indian way of cooking. The magic is in the stuffing which is suited to kids' taste buds but obviously you can modify to your liking, by this I mean spicy! Tortilla Wraps. You can get it from any grocery store. Rajma or Kidney Beans. Boiled nicely. Roughly Chopped Tomatoes. We want them in the bite so don't chop them finely. 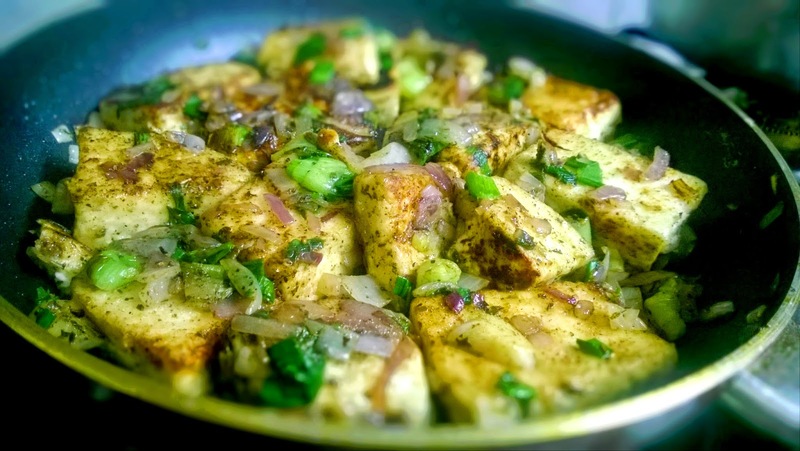 Paneer cut in small cubes. Dhaniya power and Garam Masala. So, It was time for Valentines Day and I though of making something for my beloved wife, something that she would like to eat and also showcase my love for her. Well, then I decided to go Italian as Italian symbolizes love and finesse. I made Italian Gnocchi in heart shapes. Now, I made this heart shaped and added that dash of Red as my own twist but you could make it any shape and leave out the carrots because original recipe does not have carrots. Boiled or Baked Patatoes. Both work well, just grate them nicely so that they stay fluffy and light. 1 beaten egg. If you are vegetarian, leave out the eggs. Ahhhhhhhhhhhhhh..... My blog is called Chicken Shicken and I am posting a vegetarian dish? How come? Well, people who don't eat non-veg, for them paneer is substitute of chicken, ain't it? LOL! Actually, I decided to do this post as I was getting many requests from friends to post something veg. So here it is!!! First of all, this is a super easy and tasty snack which comes under Chinese cuisine. It's called salt and pepper because the only spices you use are salt and pepper. And it is healthy! Paneer (Cottage Cheese) cut into rectangular size cubes. Ensure you get fresh paneer as its soft and not hard. Corn Flour enough to coat Paneer cubes. Chopped onions, chopped Spring Onions.